I used to cleanse every morning, but since I stopped that (several facialists told me it was unnecessary), my skin has been so much more hydrated and moist (and let’s face it, your skin doesn’t exactly get dirty while you’re sleeping). So first thing in the morning, I splash my face with luke warm water and lightly pat my skin so it’s semi dry. 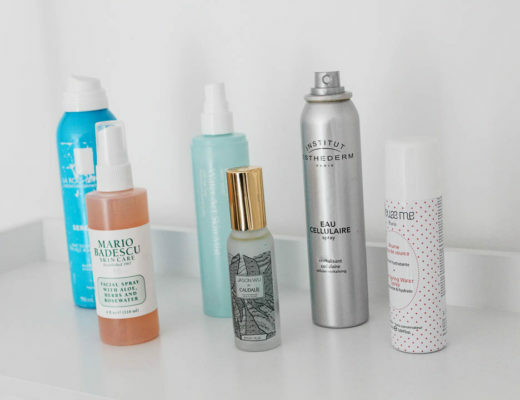 I then spray some face mist all over; I’m currently using The Gentle Label Face Mist, which is super hydrating and made from 69% organic ingredients, including Rose Water and Witch Hazel, which acts as a natural antiseptic and anti-inflammatory, whilst refining pores and controls excess oil. 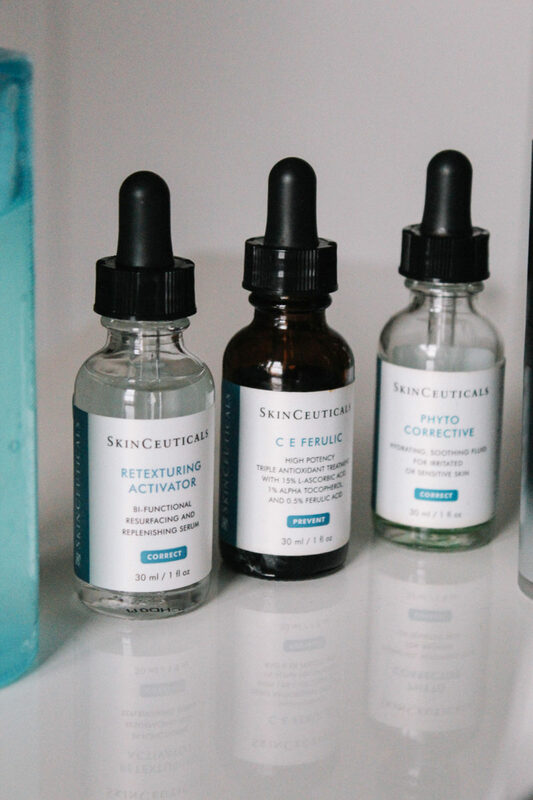 Once my skin is fully dry, I apply the SkinCeuticals Retexturing Activator, which is such an amazing, non-abrasive product, which really helps to exfoliate, smooth, re-surface, and balance skin moisture levels. After that’s sunk in, I apply one of my all-time favourite beauty product and an absolute skin game-changer, the SkinCeuticals C E Ferulic – a vitamin C serum that provides environmental protection, helps with lines, firms skin and brightens your complexion – I’m obsessed with this product. 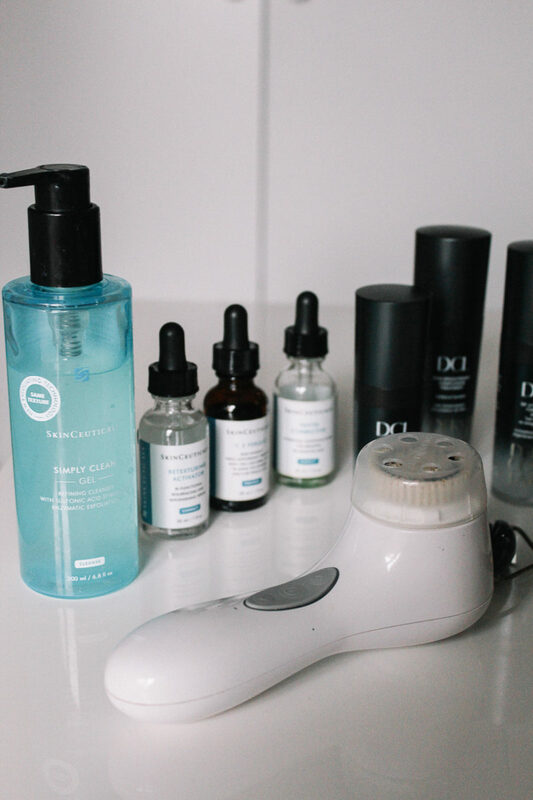 Sometimes I also use the Skinceuticals Phyto Corrective when my skin is feeling extra dehydrated and irritated; it’s enriched with botanical extracts to help calm and moisturise the skin. 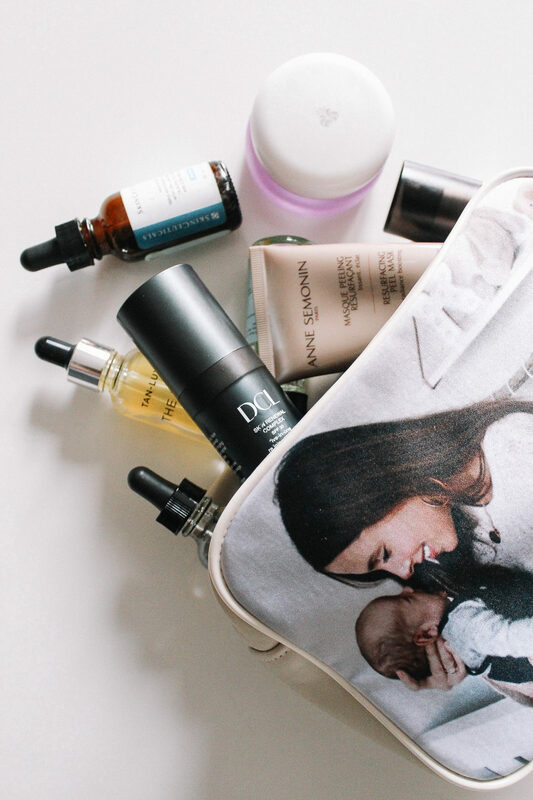 I don’t usually like to layer too many products on top of each other, so I usually skip one of the previous two products (all depending on what my skin needs that day) to keep it more simple (and effective). 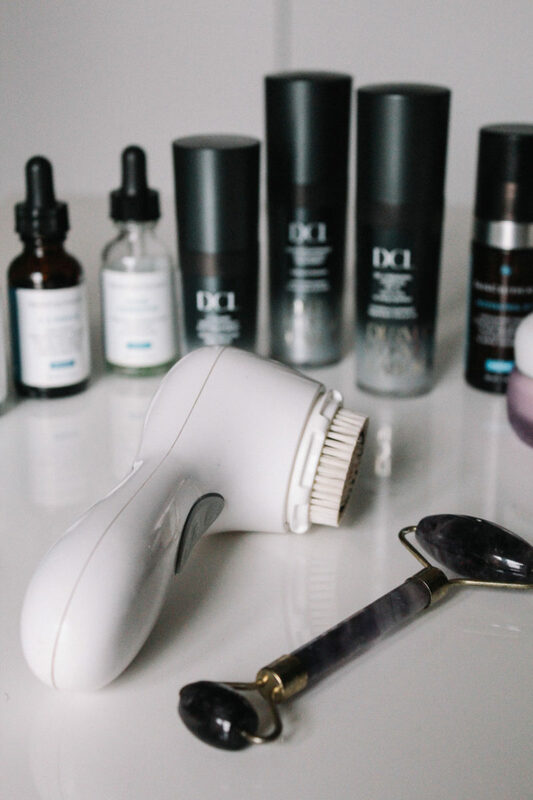 As soon as all these lightweight non-oily serums are applied, I use my jade roller, which is a soothing and cooling stone roller to help awaken, boost, de-puff and help iron out any creases and lines! I use the roller in an upward motion, working from my neck toward the forehead. 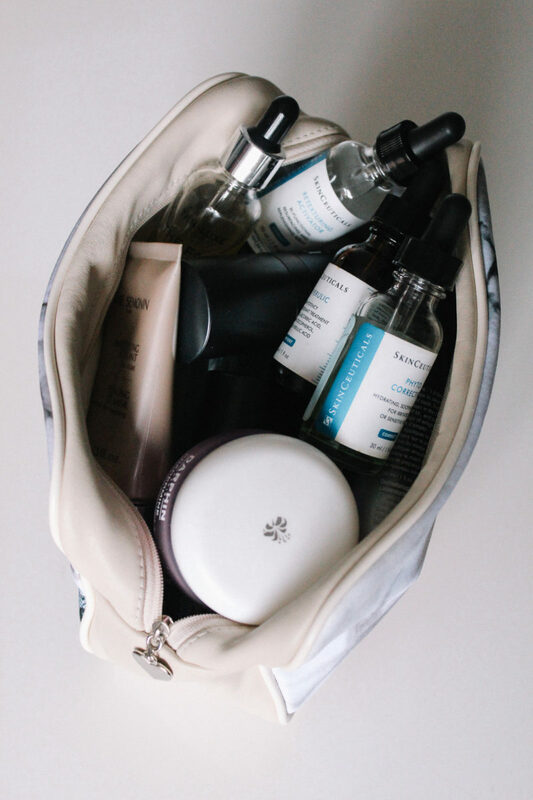 In an ideal world, I would let the SkinCeuticals product work into the skin for the next hour, before adding anything else onto it (moisturiser/SPF) – but if there’s no time for that, I move straight onto the next strep, which is application of eye cream. I’m currently using the DCL C Scape High Potency Eye Treatment, with moisturising B5, hyaluronic acid to hydrate, brighten and soften. 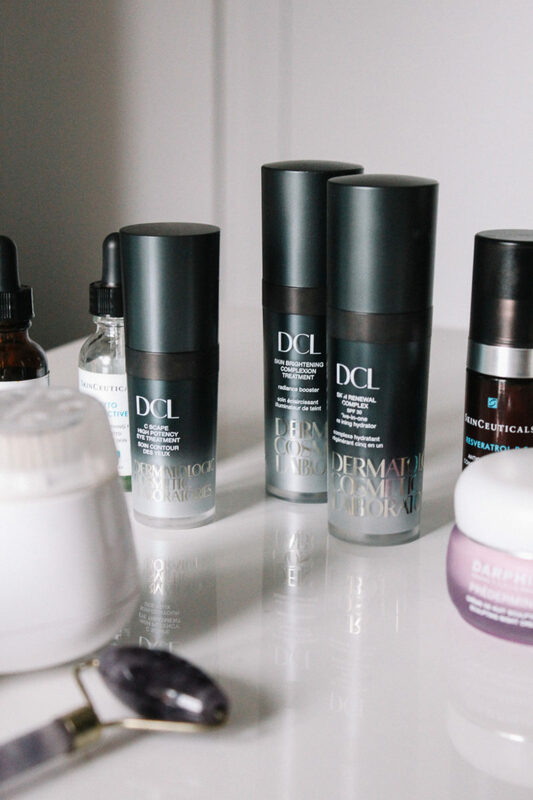 Good skin is all about preparation, so I have been using the DCL Skin Brightening Complexion Treatment ahead of the warmer months, when my pigmentation tends comes through. This lightweight creamy serum helps reduce discolouration, protects the skin, promotes cell turnover, unclogs the pores – all whilst tackling those dark spot. Last but not least, I add SPF. Come rain or shine, January or July, without fail, I always wear SPF. I usually wear SPF50 (especially during the summer), but for this time of year SPF30 is more than sufficient enough, and I’ve been using the DCL Skin Renewal Complex SPF 30 – a highly effective sun block, with hyaluronic acid to plump and smooth, vitamin B5 to hydrate, all whilst protecting against UVA and UVB rays. Lastly, 1 to 2 times a week, I use a face mask. I alternate with the type of masks – again, depending on what my skin needs. At the moment, I’ve been enjoying the Anne Semonin Resurfacing Peel Mask, which combines the effects of three different peels, to gently remove dead skin cells, leaving my skin feeling so much more radiant and bright. 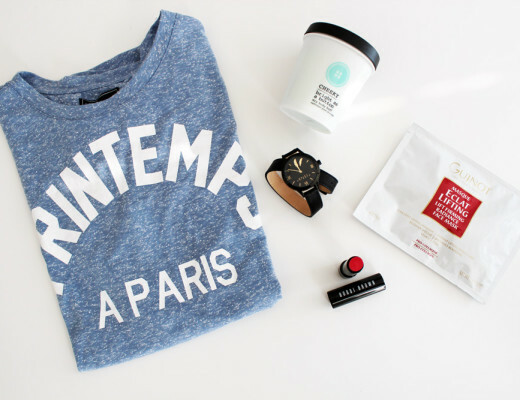 Then the last step of the morning routine (again, 1-2 times a week), I apply some Tan-Luxe The Face Anti-Age tan drops, which is by far, the best self-tanner I have come across. It gives a super natural and flawless glow, whilst still infusing your skin with oils and Aloe Vera to nourish and hydrate. The days I use this self-tanner, I usually pop it on after I’ve applied the last SkinCeuticals serums (before the moisturisers and SPF). 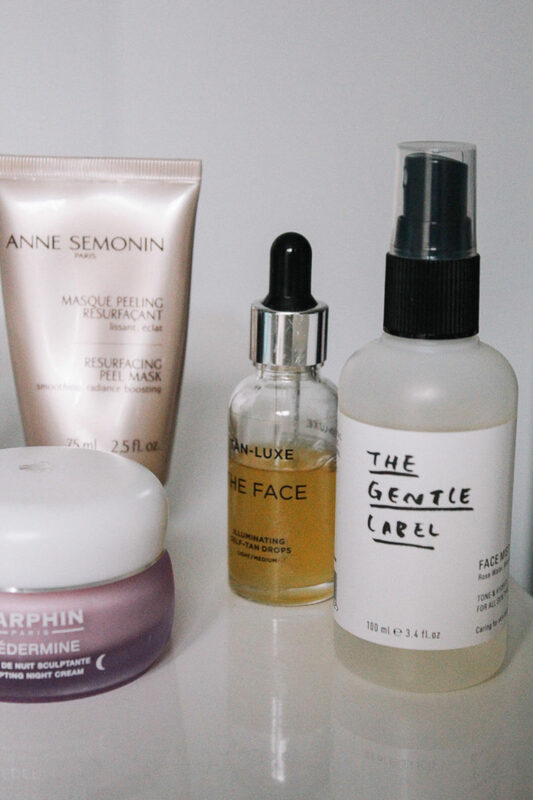 I never skip the basis of my PM routine – no matter how tired I am or how late it is, which starts with a deep cleanse (sometimes double, depending on how much make-up I’m wearing/how much grime there is to remove), toning and hydrating. 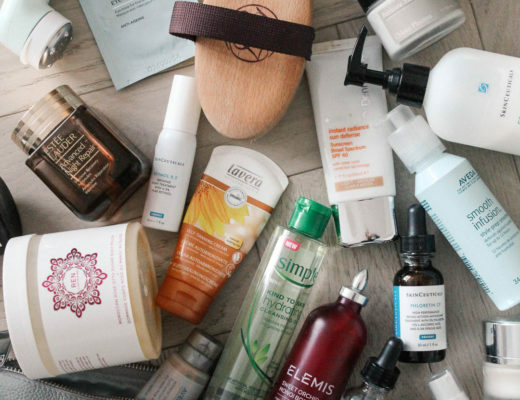 One of my all-time favourite cleansers is the SkinCeuticals Simply Clean Cleanser, which is an excellent pore-refining gel cleanser that exfoliates and soothes, whilst deeply cleansing and stripping off any impurities, excess oils and makeup. I double cleanse if needed, and 2-3 times a week I use the Clarisonic Mia 2 Sonic Skin Cleansing System, by popping some water and cleansing gel on my face and the brush, to exfoliate, fully clean and massage away any trapped impurities within the pores, After this I use the Bioderma Sébium H2O Purifying Cleansing Micelle Solution with a cotton pad, to wipe off any excess grime. I have been using this toner for years, and it’s by far the best I have come across, always leaving my skin so hydrated and soft afterwards. Finally, after my skin is all cleansed and free of all make-up and residue, I apply 1-2 pumps of the SkinCeuticals Resveratrol B E which is the ultimate night serum, full with antioxidants and pure resveratrol, to boost radiance, elasticity and firmness. After this has sunk in, the final step in my routine, is the Darphin Predermine Sculpting Night Cream, which does exactly that; plumps, nourishes and stimulates the production of collagen for tighter, and firmer skin.